Daniel Sturridge's extra-time winner earned Chelsea a Carling Cup victory over Everton as both teams were reduced to 10 men in an enthralling game. Nicolas Anelka missed a penalty but Chelsea went ahead when Jan Mucha spilled Salomon's Kalou's soft shot. Chelsea keeper Ross Turnbull saw red when he tripped Louis Saha before Petr Cech saved Leighton Baines' spot-kick. Saha's header then took the tie to extra-time as Royston Drenthe was also sent off before Sturridge pounced. Andre Villas-Boas' team booked their place in the last eight, with the likes of Fernando Torres, Frank Lampard and Juan Mata kept on the bench, and John Terry not making the trip to Liverpool. And for much of the tie it looked like they were heading out after Turnbull received his marching orders before the hour mark. Everton had several chances to pinch a winner in normal time with Drenthe firing wide and Denis Stracqualursi also having a glorious chance to steal victory with an unmarked header. Once Drenthe was ordered off for a second booking following a high tackle on Ryan Bertrand after 107 minutes, the balance of the game shifted. Baines cleared Anelka's shot off the line before substitute Sturridge was the quickest to react four minutes from time to tuck into the corner following Florent Malouda's shot. Villas-Boas was delighted at the final whistle with the marathon effort of his players, coming after they had two men sent off in the defeat by QPR on Sunday. Everton boss David Moyes will wonder how his side failed to make the 10-man advantage pay but he will be encouraged by Drenthe's display before he left he field. The Dutchman was a threat throughout the game and he and Saha, making his third start of the season, contributed to an open and robust contest. 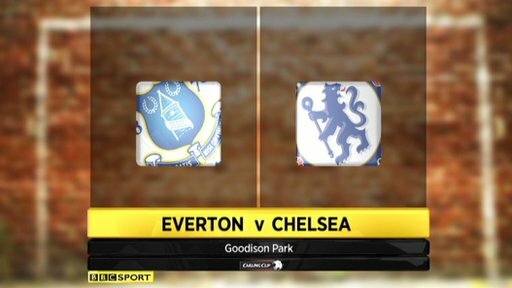 Everton's early probing made them look more likely to score, but Chelsea were presented with a penalty on 16 minutes when Johnny Heitinga brought down midfielder Josh McEachran. Anelka stepped up to take it at the Gwladys Street end but side-footed wide of the right post although there did appear to be a laser pen flashed onto the ball before he took the spot-kick. Just as the hosts were in the ascendancy, they were let down by a real clanger by second-string keeper Mucha on 38 minutes. Bertrand cut the ball back to Kalou and his floated chip from the edge of the box looked comfortable for the Slovakian keeper but he let the ball slip through his fingers. Mucha would have been delighted to see Everton earn a great chance to equalise when Turnbull brought down Saha for the game's second penalty on the hour. Turnbull was harshly sent off for the challenge as David Luiz appeared to offer the Chelsea keeper cover, but Cech's first touch was to save Baines' effort, which was drilled down the centre of the goal, before he also stopped the rebound. By this stage the action was breathless as Drenthe's free-kick hit the bar, and although Chelsea took steps to shore up their defence Saha finally pounced when he headed in substitute Coleman's right-wing cross. After a frantic end to the 90 minutes it was inevitable that in extra-time the pace of the game slowed and Drenthe's second yellow after a high tackle on Bertrand clipped Everton's advantage. Expectedly, Chelsea came back into the contest and Sturridge showed his killer instinct when he slotted in his fifth goal of the season. Everton manager David Moyes: "I don't think we deserved to lose. Certainly over 90 minutes we should have won the game. We have only got ourselves to blame for not winning it in 90 minutes." Chelsea boss Andre Villas-Boas: "We went down to 10 men, unfortunately, once again and made things even more difficult but we were able to triumph in difficulty and these are good signs for us. "We got one of the most difficult draws, Everton away with one of their strongest sides. They showed they wanted to go through this phase but we were able, not only to play good football, but show good commitment and desire. It shows we are progressing and it is very satisfying for everybody." 120:00+2:25 The whistle goes and the game ends after extra time. 120:00+1:01 Unfair challenge on Nicolas Anelka by Tim Cahill results in a free kick. Direct free kick taken by Florent Malouda. 118:09 Free kick awarded for a foul by Tim Cahill on Florent Malouda. Free kick taken by Mikel. 116:45 Shot from just outside the box by Louis Saha misses to the left of the target. 115:41 Florent Malouda takes a shot. Clearance by Jan Mucha. 115:34 Florent Malouda provided the assist for the goal. 115:34 GOAL - Daniel Sturridge:Everton 1 - 2 Chelsea A goal is scored by Daniel Sturridge from deep inside the penalty area to the bottom right corner of the goal. Everton 1-2 Chelsea. 113:41 Daniel Sturridge takes a shot. Blocked by Marouane Fellaini. 113:19 Corner taken left-footed by Florent Malouda from the left by-line, Sylvain Distin makes a clearance. 113:04 Branislav Ivanovic takes a shot. Save by Jan Mucha. Correction - 111:26 Nicolas Anelka takes a shot. Clearance made by Leighton Baines. 111:26 Nicolas Anelka takes a shot. Leighton Baines makes a clearance. 108:19 Louis Saha takes a shot. David Luiz gets a block in. 107:49 Foul by Florent Malouda on Marouane Fellaini, free kick awarded. Free kick taken by Sylvain Distin. 106:44 Direct free kick taken by Ryan Bertrand. 106:44 Sent off Royston Drenthe is sent off. 106:42 Ryan Bertrand fouled by Royston Drenthe, the ref awards a free kick. 105:51 Corner taken left-footed by Florent Malouda, clearance made by Louis Saha. 102:55 The assistant referee flags for offside against Florent Malouda. Jan Mucha takes the direct free kick. 100:50 Free kick awarded for a foul by Marouane Fellaini on Ryan Bertrand. Petr Cech takes the free kick. 99:07 Unfair challenge on David Luiz by Tim Cahill results in a free kick. Direct effort from the free kick comes in from David Luiz, save by Jan Mucha. 97:03 Outswinging corner taken from the left by-line by Royston Drenthe. 92:39 Corner taken short by Leighton Baines. 91:54 Denis Stracqualursi challenges Oriol Romeu unfairly and gives away a free kick. Mikel takes the free kick. 90:00+5:29 Normal time is of over and the game goes into extra time. 90:00+4:24 Leighton Baines takes a outswinging corner from the left by-line played to the near post, save by Branislav Ivanovic. 90:00+2:00 Shot from just outside the box by Louis Saha misses to the left of the target. 90:00+0:59 Long range shot from Branislav Ivanovic misses to the left of the target. 88:20 Leighton Baines takes a outswinging corner from the left by-line to the near post. 87:46 Outswinging corner taken from the left by-line by Leighton Baines, Royston Drenthe takes a shot. Branislav Ivanovic gets a block in. 86:35 Denis Stracqualursi has a header from inside the six-yard box and clears the crossbar. 85:55 Mikel gives away a free kick for an unfair challenge on Royston Drenthe. Royston Drenthe restarts play with the free kick. 84:46 Substitution Salomon Kalou leaves the field to be replaced by Daniel Sturridge. 84:33 Royston Drenthe produces a left-footed shot from deep inside the penalty box which goes wide of the right-hand upright. 82:59 The assist for the goal came from Seamus Coleman. 82:59 GOAL - Louis Saha:Everton 1 - 1 Chelsea Louis Saha fires in a goal from close in to the bottom right corner of the goal. Everton 1-1 Chelsea. 81:19 Free kick awarded for an unfair challenge on Branislav Ivanovic by Royston Drenthe. Mikel takes the free kick. 80:38 Substitution Diniyar Bilyaletdinov goes off and Seamus Coleman comes on. 79:16 Denis Stracqualursi challenges Ryan Bertrand unfairly and gives away a free kick. David Luiz takes the direct free kick. 77:36 Johnny Heitinga restarts play with the free kick. 77:36 Substitution Jack Rodwell goes off and Denis Stracqualursi comes on. 77:36 The referee blows for offside. 75:13 Leighton Baines crosses the ball from the free kick left-footed from left wing, clearance made by Alex. 75:13 Booking Booking for Mikel for unsporting behaviour. 75:04 Foul by Mikel on Diniyar Bilyaletdinov, free kick awarded. 74:12 Direct free kick taken by Mikel. 74:12 Booking Royston Drenthe goes into the referee's book. 74:02 Free kick awarded for a foul by Royston Drenthe on Oriol Romeu. 73:32 Nicolas Anelka concedes a free kick for a foul on Tony Hibbert. Tony Hibbert takes the free kick. 72:52 Florent Malouda fouled by Tim Cahill, the ref awards a free kick. Free kick taken by Mikel. 72:10 Long range shot from Royston Drenthe misses to the left of the goal. 70:29 Jack Rodwell concedes a free kick for a foul on Mikel. Free kick taken by Petr Cech. 68:01 David Luiz fouled by Royston Drenthe, the ref awards a free kick. Free kick taken by Petr Cech. 63:53 Free kick awarded for an unfair challenge on Royston Drenthe by Oriol Romeu. Direct effort from the free kick comes in from Royston Drenthe. 63:03 Free kick taken by Johnny Heitinga. 63:03 Substitution Mikel is brought on as a substitute for Josh McEachran. 63:03 Free kick awarded for an unfair challenge on Marouane Fellaini by Florent Malouda. 62:01 Effort from outside the penalty box by Diniyar Bilyaletdinov goes wide left of the goal. 61:47 Diniyar Bilyaletdinov takes a shot. Petr Cech makes a save. 61:29 Royston Drenthe takes a shot. Blocked by Ryan Bertrand. 60:26 Penalty taken by Leighton Baines is saved by Petr Cech. Everton 0-1 Chelsea. 57:51 Substitution (Chelsea) makes a substitution, with Petr Cech coming on for Romelu Lukaku. 57:51 Sent off Ross Turnbull dismissed for professional foul. 57:09 Nicolas Anelka gives away a free kick for an unfair challenge on Leighton Baines. Free kick taken by Sylvain Distin. Penalty awarded for a foul by Ross Turnbull on Louis Saha. 53:46 Nicolas Anelka takes a shot. Save by Jan Mucha. 52:52 Inswinging corner taken left-footed by Royston Drenthe played to the near post, clearance made by Ryan Bertrand. 50:42 Salomon Kalou takes a shot. Blocked by Johnny Heitinga. 47:43 Free kick awarded for an unfair challenge on Johnny Heitinga by Nicolas Anelka. Johnny Heitinga takes the direct free kick. 45:01 Substitution Tony Hibbert replaces Phil Neville. 45:00+2:28 The half-time whistle blows. 45:00+1:23 Inswinging corner taken from the right by-line by Royston Drenthe, Headed effort from inside the area by Sylvain Distin misses to the left of the target. 44:18 Unfair challenge on Royston Drenthe by Salomon Kalou results in a free kick. Free kick taken by Jack Rodwell. 42:07 Free kick awarded for a foul by Tim Cahill on David Luiz. David Luiz restarts play with the free kick. 41:37 Effort from inside the area by Nicolas Anelka misses to the left of the target. 41:14 Short corner worked by Florent Malouda. 40:28 The offside flag is raised against Jack Rodwell. Free kick taken by David Luiz. Correction - 37:35 Ryan Bertrand provided the assist for the goal. 37:35 The assist for the goal came from Florent Malouda. 37:35 GOAL - Salomon Kalou:Everton 0 - 1 Chelsea Salomon Kalou finds the net with a goal from just outside the box to the bottom right corner of the goal. Everton 0-1 Chelsea. 35:06 Oriol Romeu gives away a free kick for an unfair challenge on Royston Drenthe. Johnny Heitinga takes the direct free kick. 33:56 Diniyar Bilyaletdinov takes a shot. Save by Ross Turnbull. 32:58 Shot by Romelu Lukaku from deep inside the penalty area misses to the right of the goal. 32:38 Foul by Ryan Bertrand on Royston Drenthe, free kick awarded. Direct free kick taken by Johnny Heitinga. 30:22 The referee blows for offside. David Luiz takes the indirect free kick. 28:01 Foul by Tim Cahill on David Luiz, free kick awarded. Shot on goal comes in from Alex from the free kick, blocked by Tim Cahill. 27:24 Tim Cahill concedes a free kick for a foul on Oriol Romeu. Free kick taken by Alex. 24:45 Foul by Oriol Romeu on Royston Drenthe, free kick awarded. Jan Mucha restarts play with the free kick. 24:09 Corner taken left-footed by Florent Malouda to the near post, clearance by Louis Saha. 23:20 Effort from outside the area by Johnny Heitinga goes wide right of the goal. 22:26 Leighton Baines takes the free kick. 22:26 Booking The referee cautions Alex for unsporting behaviour. 22:22 Alex challenges Royston Drenthe unfairly and gives away a free kick. 20:34 Foul by Romelu Lukaku on Tim Cahill, free kick awarded. Tim Cahill restarts play with the free kick. 19:26 Free kick taken by Alex. 19:26 Booking Marouane Fellaini goes into the referee's book for unsporting behaviour. 19:09 Free kick awarded for a foul by Marouane Fellaini on Oriol Romeu. 17:10 Diniyar Bilyaletdinov takes a shot. Save by Ross Turnbull. 15:30 Placed penalty missed by Nicolas Anelka. 15:30 Josh McEachran takes a shot. Sylvain Distin gets a block in. Johnny Heitinga gives away a Penalty for an unfair challenge on Josh McEachran. 14:07 Florent Malouda takes a outswinging corner from the left by-line played to the near post, Johnny Heitinga makes a clearance. 13:37 Corner taken left-footed by Florent Malouda to the near post, Johnny Heitinga manages to make a clearance. 8:46 Louis Saha takes a shot. Clearance made by Ross Turnbull. 8:29 Free kick awarded for a foul by Marouane Fellaini on Salomon Kalou. Florent Malouda takes the free kick. 5:58 Outswinging corner taken by Leighton Baines, clearance by Alex. 5:39 Louis Saha takes a shot. Save by Ross Turnbull. 3:48 Salomon Kalou fouled by Royston Drenthe, the ref awards a free kick. Direct free kick taken by Florent Malouda. 2:31 Effort from the edge of the penalty area by Romelu Lukaku goes wide of the left-hand post.